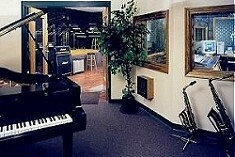 The main tracking room is 25 x 40 with a sound stage. 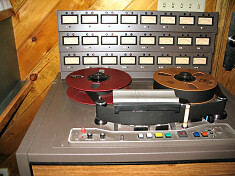 It was carefully designed by computer to feature the ambience musicians want in a room yet maintain the feel of a live club... which optimizes the feel of the entire recording process. Likewise, for more intimate or multi-tracked projects, we feature 3 iso rooms for complete separation when miking. The studio features 56 total inputs throughout. 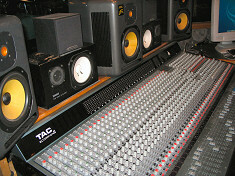 JBL playback monitors and up to 8 different headphone sends are available in the tracking rooms. 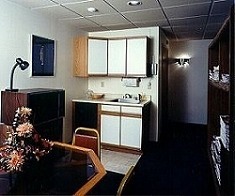 The room can easily accommodate rock and jazz bands, chamber musicians, big bands, and choral groups. 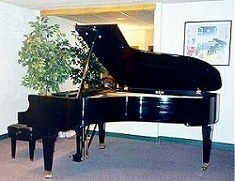 7 ft. Baldwin grand piano with German Renner action. This piano was hand picked at the Baldwin factory for it's superb tone...you must hear it to believe it! 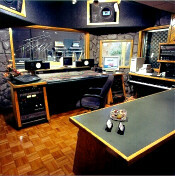 The 15 x 15 control room houses the AMEK 40 x 24 console and Pro Tool/24 system. 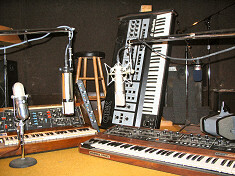 Complete MIDI programming is available with 88 key controller, MOTU Digital Performer, with rack mounted synths and samplers. 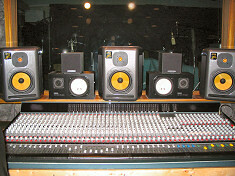 Monitoring is by UREI, Yamaha, and Auratone. All effects are housed in a convenient island that facilitates client comfort for mixing. Chill out between sessions in our kitchen/lounge.